There are two main reasons people are afraid of LinkedIn. They don’t want people to know who their customers (connections) are. They don’t want to lose employees. 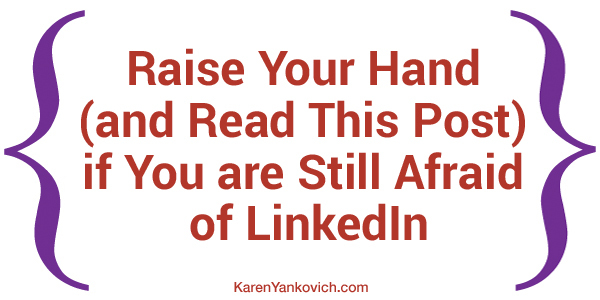 Are you still afraid of LinkedIn? Let me address these two main concerns to show you that LinkedIn is a valuable, profitable, and useful tool to have in your social media and marketing game. First: This fear basically comes down to fear of competition. But having an Non-Abundance attitude (aka there are not enough customers, success and wealth to go around) does not serve you at all. In fact this fear of competition does you a huge disservice because knowing, understanding and connecting with competitors has many valuable benefits in the long run. Huge trust. You build trust with your current customers, who now believe you have their best interests at heart. Potential successful partnerships. You very well may partner with someone completely outside of your niche, but more than likely you will find someone like you, doing something like you’re doing and realize there is a way you can do it better, together. A vast quantity of research material. Being on LinkedIn and seeing what your others post, what your connections and customers say and do, what other business owners talk about and need, can bring you a whole slew of answers to questions such as: How can I best serve my client? How can I run my business better than Sally Competition? Why are they successful and I’m barely hanging on? These are answers that equate to profits and profitability in the long run. I call BS on this. Imagine if a prospective client goes to your LinkedIn company page, and every single employee they click on has a polished, professional profile? That helps YOU my friend, the business owner. It shows that you are investing in the people that are an integral part of your business. There’s nothing but good in that. Will people leave? Of course, they do now! Let’s not focus on that, lets focus on the good it’s doing for your business image to have such rockstar employees. The biggest and best asset you can grow is employee loyalty. Your employees are the ones who can talk about their fantastic job to friends and on social networks to gain you more clients and more profits. I am an advocate of always empowering your employee to do more, to make more decisions, and to think more about “us” as a team. The minute your employees become invested in the growth and wellbeing of your company or business is the minute you truly succeed. And this has a very funny way of translating into profits as well. So create a company page on LinkedIn and have your employees link to it. Give them the responsibility of posting about activities, company values, and products. Let them be genuine and honest! An additional way for social networks to learn about you and your brand. A portfolio for prospect clients to see the amazing work your employees can do for them. A way for your employees to get kudos and recognition for a job well done, which goes far in keeping those valuable employees right where they are needed most – working for you! One caution: please make sure your employees on LinkedIn have a professional and polished profile, as polished as yours. Refer to my blog post here to know exactly what to look for and what to do in regards to your employee’s profiles on LinkedIn. So I ask you now, are you still afraid of LinkedIn? If so, that’s ok. Come on over to my LinkedIn group and tell us why. Tell us so we can help answer any questions and allay any fears.